Five teens take on H.P. Lovecraft’s monsters and their small-town high school … They’re just not sure which is worse. 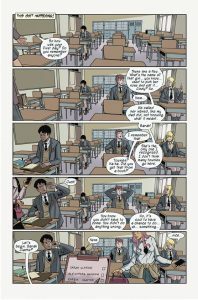 Members of the Miskatonic High School Community Services Club are out to do some good in the world. Whether that means heading out to the home of a sweet little old lady to help her clear out a cluttered basement, or stopping a sorcerer from opening a gate to the Old Ones so that he can attain nefarious dreams of immortality, it’s all the same. Karma is as karma does, right? To save the world, and themselves, this group of kids is going to have to work together, to trust each other when the odds and ancient evil are against them. That’s not going to be easy, cuz we aren’t talking about the Scooby Gang. Every member of the Community Services Club has a story to be told, and secrets of their own to keep. 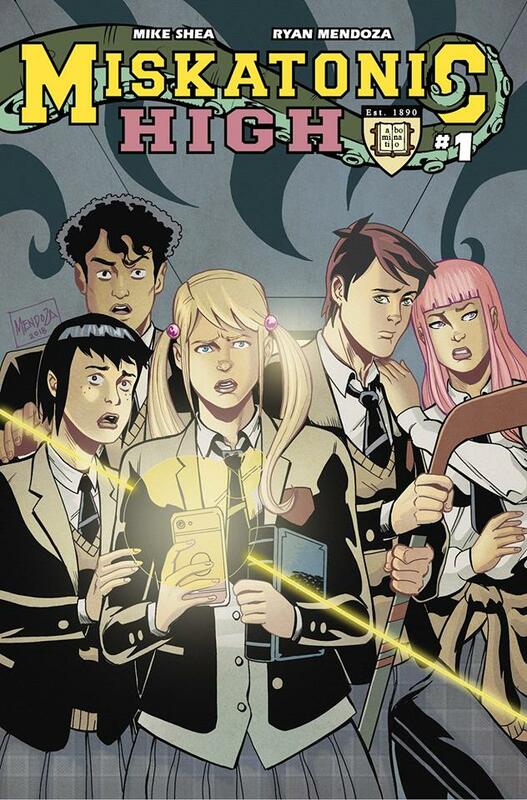 Miskatonic High, the comic, is a thematic amalgam of John Hughes and H.P. Lovecraft. 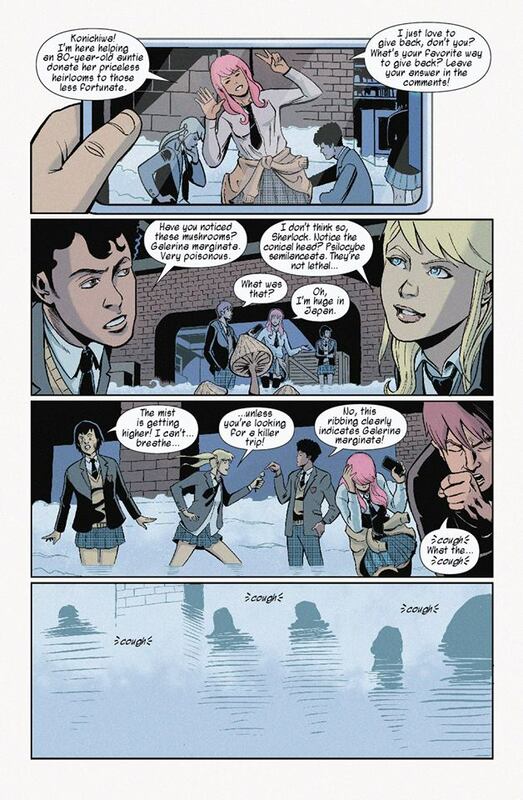 It brings a mismatched group of high schoolers together, throwing them against evil the likes of which you’d find in a dusty tome full of impossible to pronounce names. The beauty is in the execution. Despite some pretty heavy themes- mounting madness, eternal torment, human sacrifice- Mike Shea’s story stays fairly tongue in cheek. That’s a very good thing, because if anyone out there’s read Lovecraft, you know that it doesn’t really mix well with the happy-go-lucky highschool crowd. For the most part, She’s characters aren’t friends. A few of them might know each other, but it’s more in the “Hey, I’ve seen you around” way of highschool life. They’ve all got different backgrounds, and different reasons for volunteering their time. If this story were being told strictly from a Lovecraftian angle- all Mountains of Madness with no one but this group of teens standing in the way… well let’s just say that sacrifices would be made and the Old Ones would be able to pop a cold one and kick their feet up in time for Jeopardy. Instead, readers are treated to a left of center comic that embraces its oddball ways and avoids more straightforward storytelling tropes. Shea doesn’t stick to a strictly linear method of writing. His dialogue is at times broken, disjointed, and thoroughly in keeping with a group of strangers all holding different conversations simultaneously. From one panel to the next, the reader might only pick up snippets of conversation between the kids. I like the tactic, as it gives a sense of lives in motion… nobody is just standing around waiting for their bit of script to come around. Also, the characters (as well as the readers) don’t suffer through the denial phase of most stories involving supernatural rituals and multi-tentacled demons. 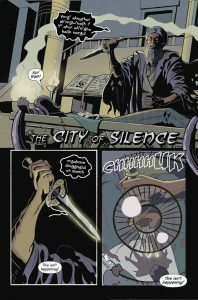 Once things start moving along, and they find themselves transported from Mrs. Abrahamson’s basement to an ancient Egyptian city, the youth of Miskatonic High take it all in stride and press on. 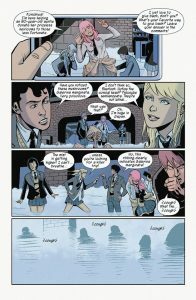 Hey, it’s a comicbook… it doesn’t have to be realistic, and there’s more entertaining ways to spend your time than slogging through pages of “I can’t believe this is happening”. 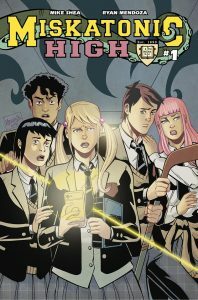 My bottom line here is that Miskatonic High has a lot going for it, and after reading two issues I’d say it’s off to a solid start. The characters work well together… even when they don’t… and in keeping with the story’s otherworldly themes there are plenty questions left unanswered (who was the sixth member of the group?). I get the impression that Shea and Mendoza have more going on in their heads than what’s been presented on the page so far, and I look forward to dipping further into their insanity.